At first glance, Moving Hazard isn’t anything new. Zombies, shooters, zombies in shooters – it’s all been done before. Burning down hordes of zombies with bullets has been an easy ticket for the FPS genre. Yet Moving Hazard’s tagline, “Every Zombie Is Your Weapon,” was offering a different hook. I stopped by the game’s booth at PAX South 2016 to get hands on and understand this FPS’s distinct twist. It was pretty clear from the moment I got at the booth that Moving Hazard was popular on the floor. With over a dozen computers running the game demo, the booth remained cramped and there were people waiting in line. Other games media were dropping in without appointments frequently. Thankfully I had an appointment, and after a few minutes wait, I scrunched in the back of the booth with Outfoxed to get hands on with the game. Pictured: The line to play. 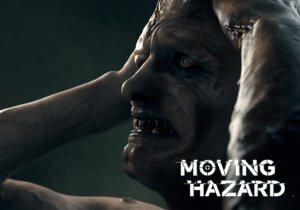 Essentially, Moving Hazard is a PvPvE game with two player teams and the AI-controlled zombies playing as a common enemy. The key to the game’s main calling card is an additional piece to the standard shooter arsenal: distractors. These tools are part of your loadout and allow you to manipulate the hordes of zombies, whether it’s distracting them for a while with a damper to keep them from gnawing your face off, or grouping them up to use PAM, a pheromone-laced molotov cocktail that sends them rushing after your enemies in an enhanced rage. Zombies are serious business in Moving Hazard, too. Ranging from the slow shamblers of classic horror films to the seriously powerful speed-rushers of 28 Days Later, even bumping into a zombie once can put a serious dent in your health. This is in part due to the fact that zombies of this alternate timeline are also affected by a parasite which makes them essentially immortal, developing buboes to fill in gaps and wounds. Sure, you can shoot them down, but it’s a pointless fight – you’re better off playing keep away and using them as weapons. Shooting zombies mindlessly is the quickest way to lose the round. And from the start of a match, zombies are all over. The map is constantly filled with the walking dead, to a point where you really can’t make one 360 degree visual sweep without spotting a few. Getting from point A to point B across the map requires not only careful pathing but being prepared to use a distractor or shoot down a zed at the right moment. And think you can stand still for a few moments safely? Guess again – you better make sure someone has your back, because there will be a zed gnawing on your neck-bone before you know it. Put together with a squad-based competitive FPS, these zombie mechanics make Moving Hazard a game full of tension, of awareness and reaction. Even in a PAX demo full of newbies, I couldn’t really afford to take my eyes off the screen for more than a second or two to look at the developer explaining the game’s mechanics. It was fun, intense, and frantic, and it was clear skill and strategy will be playing a major role at the game’s competitive levels. This is what you're afraid you'll see every time you turn around. The game will feature multiple PvP modes, along with a single-player campaign and co-op horde mode, plus multiple maps and features to offer a complete tactical shooter experience. Still in early testing stages, there’s plenty of balancing issues to address, but the game nonetheless feels relatively polished at this state of development. It’s 2016 release goal is hardly marketing hype and likely attainable. How well it will stand out against other zombie shooters, though, I think remains to be seen. With only one real mechanic making Moving Hazard a selling point over the cookie-cutter zed-FPS, Psyop and IllFonic will need to deliver a flawless product to make a dent into a saturated niche market.